7 Sales Performance Tips from "How to Become a Rainmaker"
Jeffrey Fox’s “How to Become a Rainmaker” is a legendary guide surrounding Fox’s rules for “getting and keeping customers and clients.” For anyone who hasn’t immersed themselves in Fox’s approach to becoming a sales leader, this is a must read. Despite the many changes sales has seen since the book was written in 2000, it’s still up there with the best of the best of books about sales performance. At least I think so. If you haven’t gotten around to it yet, fear not: We’re here to paraphrase and pack a punch of crucial takeaways from Fox’s sales manifesto. It’d hard to leave the Rainmaker’s Credo off this list. It’s the Ten Commandments of sales, although it’s more like a dozen or so. All great mantras that anyone should keep in mind to improve sales performance, Fox includes each of these credos because they’re his ultimate sales KPIs. Make (or give) customers what they need. Make your product the way customers want it. Get your product to your customers when they want it. Give your customers a little extra — more than they expect. Remind customers of the dollarized value they received. Help customers pay you, so they won’t be embarrassed and go elsewhere. Ask to do it again. There are many things your salespeople should ask buyers to diagnose their needs but the question of all questions is why a customer should be doing business with your business. This question addresses points like what value you offer over competitors and why the customer will benefit from your services. 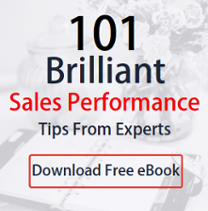 Fox believes this one’s central to optimal sales performance, because with the answers on hand, well, you have all the answers you need. 3. Treat each customer as you would treat yourself. A great lesson for sales and life in general, this approach toward your buyer is something that can truly be detected through the sales process. Fox urges you to “deliver on your promise.” Putting yourself in your customers’ shoes ultimately helps you understand them better, boosting your sales performance because you deliver better service. Start thinking about this as you interact with buyers. That’s how the rainmaker makes rain. Then when you’re ready to treat them like yourself, bring your umbrella with you. Starting to sound like Fox, aren’t I? 4. Build a pre-call plan for every sales call. Written sales call objective – Write out what your objective(s) for this call are. Analysis questions – Ask questions that allow you to further analyze the situation (for example, how many employees does the prospect’s company currently have?). Something to show – Maybe it’s an offer. Maybe it’s a new product. Don’t show up empty-handed. Anticipated buyer concerns and objections – Always be one step ahead and come prepared with reassuring solutions to the concerns you expect. Points of difference vis-à-vis competitors – Know your competition. Present your differences in a factual manner that does not diminish your competitor’s product. Meaningful buyer benefits – Benefits are all businesses care about. Don’t forget. Dollarizing buyer benefits – Calculate a dollar amount that could be saved or earned with your product over their current situation. Strategies to handle objections and eliminate buyer concerns – Have clear plans in place that will quell any concerns. Closing strategies – Plan a closing phrase that will take the conversation to next steps. Expected surprises – Don’t be caught off guard. Know how to handle surprises. If you don’t have an immediate answer when on a call, let the buyer know that you are working on one. These tasks prepare you for several situations before you even pick up the phone. 5. Always dollarize the benefits of your product. Too often, we don’t help the buyer understand exactly how our product would help their business, especially in dollars. This is what really matters at the end of the day, isn’t it? Rainmakers dollarize by pairing the buyer’s ROI with their own product and also dollarizing the financial consequence of passing up on their product. Genius. How didn’t I think of that? 6. Ask 6 killer questions. I’ve tried a few of these questions myself and can attest to their power. They give you the information you need to optimize your sales performance — to move forward or backward. Will you decide for yourself? Is there anything else prohibiting you from going ahead? What question should I be asking that I’m not asking? You can already see how each question guides the buyer in a productive direction, by helping them understand where they are in the buying process and allowing you to capitalize on their response. 7. Keep track of your sales performance skills. These are the key milestones that Fox believes we can put points behind to use as benchmarks for success. Try using them as sales KPIs to keep track of your progress. This blog could go on and on about all of Fox’s insights into sales performance and selling in general. It’s full of little tidbits of advice like the best time of week to sell (Friday afternoon) and that you should never put your pen in your shirt pocket (for fear of it bursting and distracting in a meeting) and not to drink coffee en route to a meeting (same reason, essentially). His perspective is clear and full of no brainers, but the best ideas are often just that. Fox offers many pieces of valuable advice, but we’re going to focus on seven that will improve your sales performance. Here’s what you should know.